Creating copy for marketing emails is no easy job. And let’s face it, not everybody is a natural copywriter. However, it’s critical that your email content is relevant and engaging so that your emails are opened and acted on. 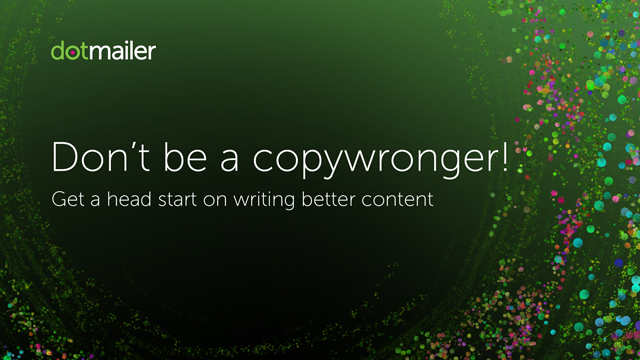 Join us for our webinar: Don't be a copywronger. Where we'll be discussing the dos and don'ts when it comes to writing engaging copy, helping you to send better emails now. • See strong content examples to help you become a copy-RIGHT-er! Ever found yourself daunted at the prospect of organizing an event? Do you think something is missing from your event marketing strategy? We get it, promoting an event can be stressful at the best of times. That's why we'll show you how to stand out of the crowd and capture people's attention using Engagement Cloud. Join our Engagement Cloud expert, Dominic Thomas, as he shows you the answers to your problems! He'll show you just how easy it is to set-up your event strategy in the platform, so you can sit back, relax and watch the registrations flood in! In this recorded webinar we look at how sometimes the simplest content can have the biggest response from your audience. Listen in as dotmailer Digital Strategist, Gavin Laugenie and Creative Director, Ger Ashby, share expertise on how less is more in the world of busy inboxes. Rather than bombard you with pure theory and statistics, we will show you how to implement some of these design elements in your own emails. We'll cover: designing for 'images off' recipients, enhancing creative with animation, effective CTAs to increase engagement and all-important design best practices. Jingle all the way to success. Yes, we know the holidays feel far away, but it’s time to start planning your holiday strategy now before time runs out. Beatrice Ellefsen, who heads up the APAC Customer Success team, walks through what you need to start thinking about in the lead up to the holidays. Advice on how to plan as much as possible now, and avoid last minute campaign planning. Mark out your key dates, drive foot traffic in-store, start pre-sales and social hype, and see some real-time content examples from one of our partners Moveable Ink. Chris Ash, one of our Customer Success team show you how to setup and make use of the latest multi-channel touchpoints in dotmailer’s program builder. Learn how to make use of new program segments and hear insight into testing methodologies and how to test multiple program streams using a single email account. With 62% of B2B marketing leaders reporting that improving marketing returns on investment is a critical priority for 2018, email marketing automation is made for B2B. A top-notch ESP offers a scalable, cost-effective method to guide customers through every stage of the complex buying process, provides a data-driven aid to capturing, scoring and nurturing leads, and helps businesses retain customers with timely, relevant messaging. Human conversations at scale. Looking into how to make your emails more personal, what data should you be using, and how to avoid being too creepy. Beatrice Ellefsen, who heads up the APAC Customer Success team, does a tour of her own inbox, showing some great examples of personalisation, beyond flat data. Walk through two big-brand preference centres, hear opinions on what makes campaigns more relevant, look at brands who infer preferences from behaviour, and learn how to increase your interaction with personalised content. You only get one chance to make a first impression. Building the programmes to make it worthwhile, and learn more about your new contacts. Beatrice Ellefsen, who heads up the APAC Customer Success team, takes a holistic view of setting up a welcome programme to make a great first impression. Includes a look at sign up forms, surveys, updating data fields, using default data fields and dynamic content, progressive profiling through welcome programmes, and strategic ideas on how to personalise those programmes based on contact behaviour, all in under one hour! Acquire smarter. Convert faster. Deliver big. Founded in a London pub in 1999, we’ve come a long way to get here. Today, dotdigital has over 350+ employees and offices across four continents. Our aim is simple. To empower marketers to achieve their goals in faster and smarter ways. dotdigital’s easy-to-use Engagement Cloud combines powerful technology with passionate people to deliver an unbeatable service.